Moving, as you hear the word you simply get worried? You can relax a bit if you have enough time in your hand. But what if it is all of a sudden? How would you do it? What if someone asks you to shift within a week? Some of you might spend most of the time overthinking over it and create a mess all over. While others might think it is not at all possible. Well, everything is possible. All you have to do is to stop worrying and start organising. If you think and act in a direction that you can do it. It is certainly possible. You may face small difficulty but if you follow the tips detailed in the blog it can be made simpler. The tips come from the frequent movers, follow them to make your moving easier. Do not stick to hard work follow smart work. It is important to hire professionals don’t just jump into doing all the things yourself rather focus on organising and making arrangements. Make sure you hire both the packers and movers. You make a list of things that you want to carry along. Ask the moving company to bring the packing material themselves. Do not indulge in unnecessary things. Take quick decisions but make sure you keep calm and do not panic. Have documentation and bills of everything you order or any services you seek. Especially, it is important to have an agreement with the moving company. Discuss the time limit with the company and make sure you ask them to complete the packing within 4 days, no matter they have to extend their working hours. Do not pack your clothes, if you are shifting your wardrobe along. Just carry the wardrobe as it is. You don’t have to worry about the load, as loading and unloading would be done by the crew members of the moving company. Label all the boxes. It would be easy to identify the items in the boxes. Packers know how to pack and they have all the ideas, do not waste your time supervising them. Empty your storeroom and keep all the packed boxes in the single room. Do not scatter your packed items, you would be confused on the day of your move. If you have kids, make sure you pack a separate bag for them. This task is to be done by yourself. Keep all the essentials of the kids in the bag and carry the bag with you in your car and do not push into the transport truck. Do not carry everything. Neither you have time to pack not it is required. Be as light as you can. It is better to spread out a sale and get rid off all the things that you do not use. Things that are not useful here will never be used in your new home. It is better to make some money off these useless things than paying money to shift the load. One more bag of toiletries, towels, a few clothes and other necessary things that would be required immediately once you reach your new home must be packed by you. This bag also must be in your car. 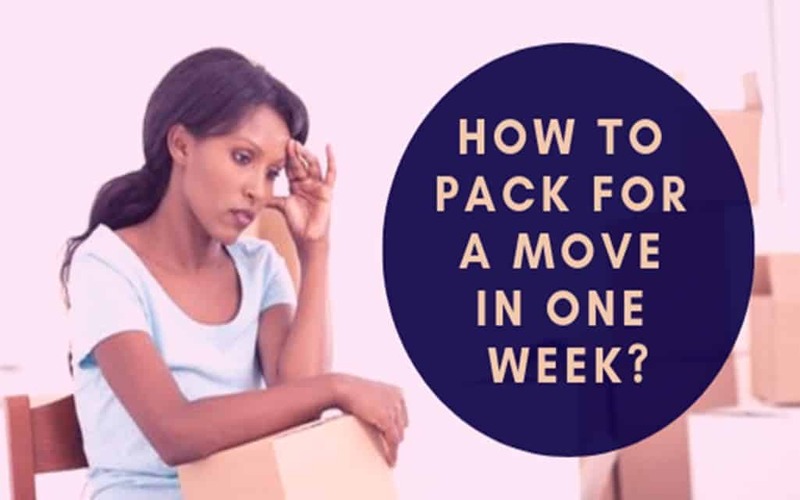 Yes, you can pack in a week even less if you follow the tricks detailed in the block above. You will not even be burdened much and everything would be completed easily. Seek help from wherever and whenever you can, handling things with a single hand can be really tough.